DoubleSwitch is a doubled version of our popular BattleSwitch. DoubleSwitch is a relay switch that you toggle via hobby radio control gear. You can use DoubleSwitch to quickly and easily control lighting systems with two different voltages, motors, pumps, smoke generators, sound units and more! Will also control glow plugs and BattleBot weaponry. You can activate these components with voltage levels as high as 240VAC without having to know anything about microcontroller logic levels or transistors because the relay offers full electrical isolation from your receiver electronics. 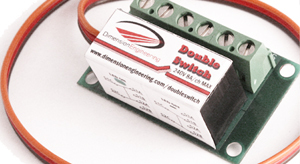 DoubleSwitch plugs into a standard hobby radio control receiver as easily as a servo does. You connect the loads that you want to toggle using DoubleSwitch's wear resistant screw terminals. Depending on the channel you use, you will then be able to control the relays by moving your radio's control stick up or down, left or right, or with a switch. Activation of this switch will power up both outputs at the same time. INDIVIDUAL CONTROL OF THE TWO POWER OUTPUTS IS NOT POSSIBLE. Dimensions: 1.65" X 1" X 0.72"